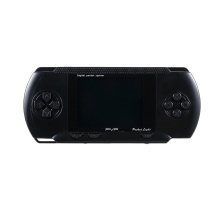 This handheld game console has a compact size-3.0 inch colorful screen, is perfect for playing while traveling and the AV out function enables you to enjoy big screen games. With built-in 132 classic games and a expansion card of 28 games, it is your choice to gain the fun of your childhood and share the fun with your child and family. 132 (built-in) and 28 (game card expansion) classic games, a wide variation for your choice. Compact size and lightweight, easy to carry, perfect for playing while traveling. 3.0 colorful screen and AV out function, brings you a better playing experience. Rechargeable big capacity battery, long service time and endless happiness. Easy to use, just plug and play, no need to download and installation. A perfect retro game machine to remember your childhood and enjoy fun with family.